I was recently working with a client on their lead generation strategy. We were talking about messaging, keyword strategy and the content we wanted to create to support their sales process. As the conversation got deeper, my client made a mistake that is both common and damaging to sales growth efforts. He was totally focused on content that answered the question, “Why is my company the best choice,” while ignoring, “Why should people consider talking to us?” He was naturally focused on the bottom of the funnel, while totally ignoring the top and even the middle. If you’re selling a commodity product that has a high frequency of re-buying, then this type of focus is fine. However, in B2B sales, if your solution requires any type of change on the part of the customer, or isn’t regularly procured you’ll lose a lot of opportunities with this approach. Twenty years ago I made an intriguing discovery that has changed the way I sell (and market) ever since. I realized that when I was selling, I wasn’t making one sale; I was making three. I discovered that while my competitors were expending all of their effort on what I call “the third sale,” I gained a tremendous sales advantage by focusing on the first two. What’s more, when I focused on the first two sales, I was able to spend very little time on the third…the sale was made without having to compete. I have a problem (something is not working the way I want it to). The status quo is no longer viable. This is my problem and its cause. Most selling organizations leave it to the customer to come to this decision on their own. This makes it highly unlikely that their problem definition will match up to your advantages. What’s worse, when you don’t get agreement on the second and third decisions in this phase, you end up assuming things. You expend tremendous energy and resource without ever confirming that you and the prospect are seeing things from the same perspective. 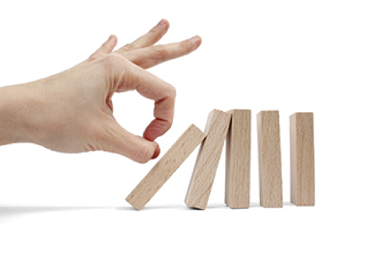 Additionally, sellers typically assume the second and third decisions. They hear the customer/prospect say, “I have a problem,” (which really means I’ve noticed a symptom) and they jump right into third-sale mode. As I’ve shared before, the best way to shorten the sales cycle is to slow down the sales process. This means that you need to focus your marketing, lead generation and sales efforts on provoking awareness and defining the problem. The failure to do so will reduce your opportunity universe and cost you significant margins. The next sale focuses on defining the best way to solve the problem that was defined in Sale 1. I regularly hear about how unpredictable and irrational prospects are. While there’s certainly truth there, the single biggest predictor of an action that a prospect is going to take is based upon how they define their situation or problem. If you haven’t influenced your prospect in Sale 1, then the way they analyze and make decisions in Sale 2 will not be very predictable. How they will determine who/what the best choice is. This happens for every customer, every time they buy anything. Sometimes it happens consciously, sometimes it’s happens not-consciously and sometimes it happens with the influence of a selling organization. It is in this phase where buyer-seller alignment gets locked in. This phase should be highly collaborative, so if you skip this step it is highly unlikely you’ll truly be in-sync with your customers/prospects. If you leave it to the customer/prospect to determine this outside your influence, you’ll most likely be dealing with decision criteria that address the acute symptoms, not the chronic causes. As such, your risk of being commoditized is much higher. If your message is all about Sale 3 (why you’re the best choice) you make it less likely that your prospect/customer will engage with you as a trusted advisor within Sale 1 and Sale 2. Aaahhh, Sale 3. The sale most peddlers salespeople are comfortable with. This is all about you and your capabilities. This is the place where proof statements are powerful and case studies are at their best. It is here where the customer decides who they’re going to use or buy from. While I don’t want to under-value the importance of this phase, I think you’ll agree that the real decision is actually made by how the prospect/customer makes the decisions in Sale 1 and Sale 2. Understanding where the customer is in their decision journey is crucial to the marketing and sales posture you should be taking. In Sale 1, you should be focused on educating your customers about their problems and the causes of their problem. 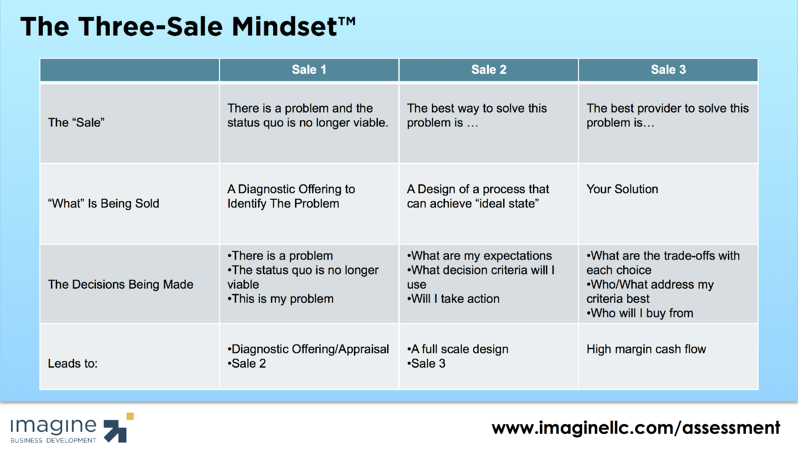 In Sale 2, you need to be a resource as your customer works to figure out the best way to solve the problem. In Sale 3, you serve in the traditional sales role and the focus needs to be on why you’re the best choice. If you think about this from the perspective of the sales and marketing funnel, Sale 1 occurs above the funnel and at the top, Sale 2 occurs in the middle and Sale 3 is at the bottom. Sinek says people don’t buy what you do; rather they buy why you do it. His famous TED presentation got people stimulated to figure out their why and the “golden circle” became a common marketing and messaging topic. Sale 1 is your why. Sale 2 is your how. Sale 3 is your what. As you review and enhance your go-to-market and sales strategies, be sure that you’re creating the content and engagement for the first two sales, and you’ll find the third sales (where you get paid) happens more frequently, predictably and profitably.